Wild dolphins are an elusive subject for behavioral studies: How can you "do a Jane Goodall" on animals usually visible only as a glimpse of rolling dorsal fins heading for the horizon? In this unusual book, two of the best-known scientists in the marine-mammal field have assembled an astonishing variety of discoveries about dolphins. The contributions range from a graduate student's first paper to senior scientists summarizing a lifetime of research. The dolphins they have studied range from tiny spinners to majestic pilot whales, from killer whales to the familiar bottle-nosed dolphin. The research tactics vary just as widely: the researchers have followed dolphins in boats, tracked them from shore, dived among hundreds of them (plus a few sharks) in tuna fishing nets. They have used computers and airplanes, genetic analysis and artificial language, and learned to read the life history of a dolphin from the cross-section of a single tooth. 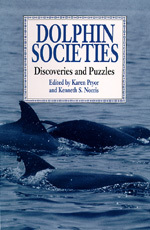 Pryor and Norris are successful writers as well as scientists; the book is peppered with entertaining essays, by one or both editors, on the intriguing history of dolphin research. Dolphin Societies not only surveys the most interesting recent research on dolphin behavior but also gives lay readers a fascinating look at the scientific mind at work. Karen Pryor was a founder of Sea Life Park in Hawaii, where she pioneered many dolphin-training techniques. She is the author of numerous papers and several books, including Karen Pryor on Behavior: Essays and Research (1994), and has served on the U.S. Marine Mammal Commission. Kenneth S. Norris is Professor Emeritus of Natural History and Biology at the University of California, Santa Cruz, and one of America's senior mammalogists and conservationists. His work established that dolphins use echolocation. He helped draft the Marine Mammal Protection Act. His books include The Hawaiian Spinner Dolphin (California, 1994).